Monarchs can exist wherever milkweeds grow. 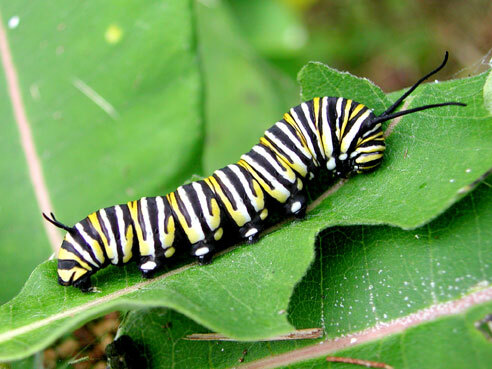 Monarch larvae, or caterpillars, feed exclusively on milkweed leaves. In eastern Canada, the main plant on which monarchs develop is the common milkweed Asclepias syriaca. Common milkweed grows widely on abandoned farmlands, along roadsides, and in other open areas where weedy species thrive. In western Canada, showy milkweed Asclepias speciosa is the primary larval host plant. Monarchs are wide-ranging and powerful fliers. They are able to seek out even the smallest patches of milkweed, including plants growing in city gardens and along busy highways. 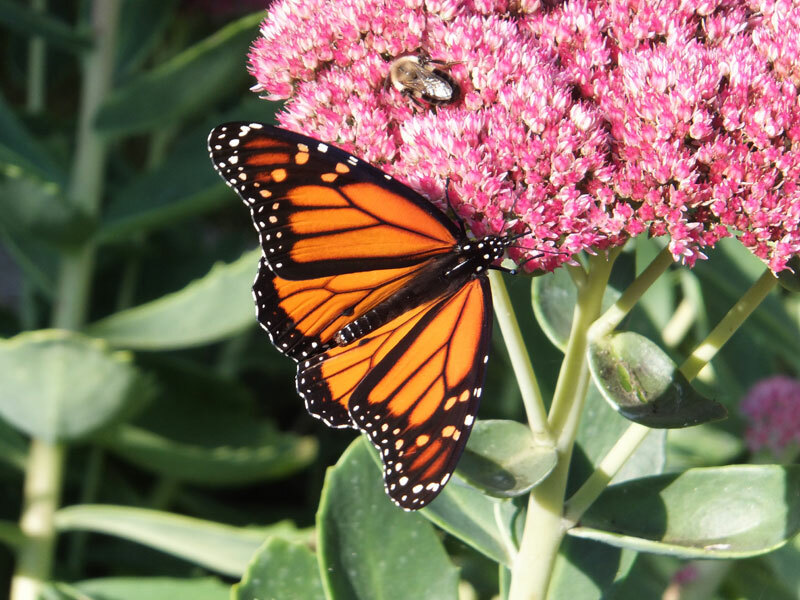 Not limited by human disruption, monarchs will breed readily on milkweeds in areas where there is a high level of human activity, as long as the plants are healthy. The monarch has also proved itself to be a highly adaptive species. In the last 150 years there has been a major shift in the North American distribution of the eastern population. This appears to have resulted from the widespread conversion of the natural midwestern prairie to crop land, a process that destroyed much of the native prairie plants and animals including about 22 species of milkweeds. At the same time, many areas of the deciduous forests of eastern North America were cleared for farming, allowing the rapid spread and increasing abundance of the common milkweed in the cleared lands. The cleared portions of the eastern deciduous forest region correspond to the principal breeding area of the eastern population of the monarch today. During migration, monarchs conserve energy by riding columns of rising warm air, which greatly reduces the need to flap their wings for sustained periods. They frequently reach high altitudes where strong prevailing winds speed their flight. 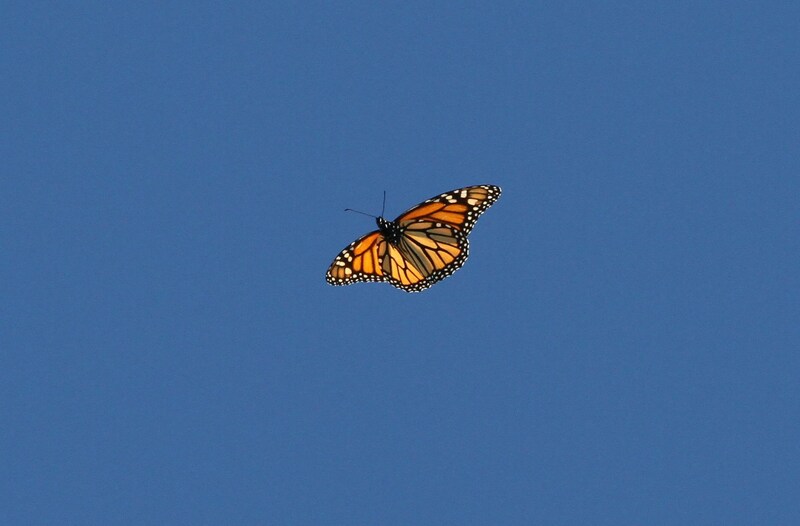 Glider pilots have observed migrating monarchs flying more than a kilometre above the ground. 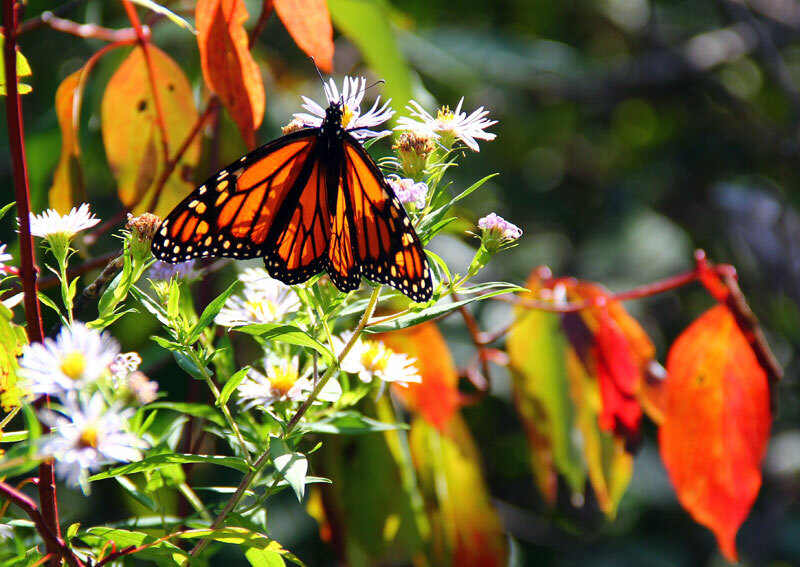 In the fall, monarchs migrate thousands of kilometres, travelling from Canada to Mexico. In Canada, they can been seen in southern Ontario, especially in such areas as Point Pelee National Park, on the shores of Lake Erie, and Presqu’ile Provincial Park, on Lake Ontario, where they cluster together on trees to form overnight roosts before crossing the lakes. These clusters can be miniature versions of the dense colonies at the overwintering sites. These overnight roosts may contain a few hundred to several thousand individuals. Monarchs usually form clusters in the same areas year after year. Monarchs migrating south in the fall build up in large concentrations along the north shores of Lake Ontario and Lake Erie. Their apparent reluctance to fly over large bodies of water is probably the reason they fly southwestward following the shoreline. This inevitably results in large concentrations of monarchs accumulating on peninsulas jutting out into lakes where they eventually have to move southward over open water. The monarch is unique among North American butterflies in performing an annual two-way migration in vast numbers from one area of the continent to another. Probably no other insect among the millions of species on earth performs a similar migration. Scientists still have much to learn about how individual monarchs are able to return each year to overwintering sites and breeding grounds they have never seen. The many millions of monarchs blanketing forested mountain slopes in Mexico is a spectacle of tremendous natural beauty and a unique phenomenon produced nowhere else on earth. Unlike most butterfly larvae, which are coloured to blend in with their surroundings, monarch larvae are brightly coloured. Their conspicuous appearance serves as a warning to potential predators that the monarchs are poisonous. This is because they ingest poisonous juices from the milkweed plants on which they hatch. 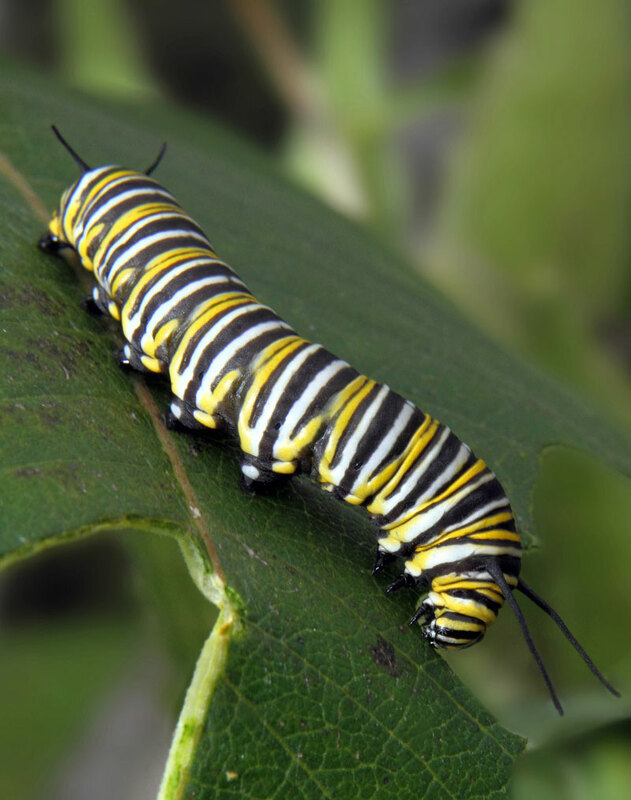 Any animal unwise enough to eat either an adult or a caterpillar monarch will probably become ill and suffer severe vomiting. The monarch is widely distributed across North America, from Central America northwards to southern Canada, and from the Atlantic to the Pacific coasts. Within Canada, the monarch has been recorded in all 10 provinces and in the Northwest Territories. Three geographically distinct populations — eastern, western, and Central American — make up the total North American range of the species. Each of these populations has a distinct migratory pattern. The eastern population is the largest of the three and includes all monarchs east of the Rocky Mountains in the United States and Canada. The eastern population accounts for over 90 percent of the Canadian distribution of the species. The current annual breeding range of the eastern population extends from the Gulf Coast states northwards to southern Canada, and from the Great Plains states and Prairie provinces eastwards to the Atlantic coast of the United States and the Maritime provinces. The entire eastern population migrates to about 12 overwintering sites in central Mexico, where the butterflies congregate in vast numbers. These sites, which are specialized high-altitude ecosystems, are all located within a small area of approximately 800 square kilometres and occur only in oyamel fir forests. Migrating eastern monarchs reach the overwintering sites from November to late December. They form dense groupings of tens of millions of individuals and remain relatively inactive over the winter months. When the colonies break up in March and early April, the butterflies migrate north to the Gulf Coast of the United States, where the females lay their eggs on milkweeds. Two or three generations, or broods, of monarchs are produced here in the spring, and it is these offspring of the overwintering generation that continue the migration to the northern breeding range. This step-by-step migration is necessary since milkweeds die out in the Gulf Coast region in June. Continuing north allows monarchs to exploit the milkweed resources of central and northeastern North America, enabling the species to produce up to three additional summer generations. These generations are critical to rebuild the population losses at the overwintering sites. Eastern monarchs reach Canada most years, although numbers can vary dramatically from year to year, depending on the success of overwintering in Mexico and the size of spring generations produced annually in the Gulf Coast states during the spring migration. The first returning migrants reach southern Canada near the end of May and the first week of June. The western population includes all monarchs found west of the Rocky Mountains in the United States and Canada. The current annual breeding range of western monarchs extends from Arizona and New Mexico to southern British Columbia and from the Rocky Mountains westward to the Pacific coast. Western monarchs reach British Columbia only in summers with extended periods of warm, sunny weather in the Pacific northwest. During such favourable years, breeding occurs in scattered locations across the province, particularly in the Okanagan Valley and along the Fraser River. Monarchs of the western population undertake an annual migration much like that of the eastern population. They overwinter at numerous sites along the nearly 1 000 kilometres of the California coast to the Mexican border. More than 200 overwintering sites have been recorded in California, and individual colonies may support dozens to tens of thousands of individuals. The vast majority of these overwintering sites are associated with stands of non-native Australian eucalyptus trees. The annual southward migration of the eastern and western monarch populations begins in Canada in early August and continues through to mid-October. When monarchs are migrating, they do not reproduce. They avidly seek nectar from flowers to fuel their migration and to build up a critical fat reserve to sustain them through the winter. This stored fat is also essential for their northward migration in the spring, when nectar sources are not available. The Central American monarch population occurs in Guatemala, El Salvador, Honduras, Belize, Nicaragua, Costa Rica, Panama, and southern Mexico. Unlike the eastern and western populations, the Central American population migrates only 10 to 100 km between highland and lowland areas, according to dry and wet seasonal conditions. This monarch population reproduces throughout the year. Europe and South America, probably aided by ships. Adult monarchs will feed on the nectar of many flowers, but they breed only where milkweeds occur. The leaves of the milkweed are the sole food of the larvae, or caterpillars, that emerge from the eggs. 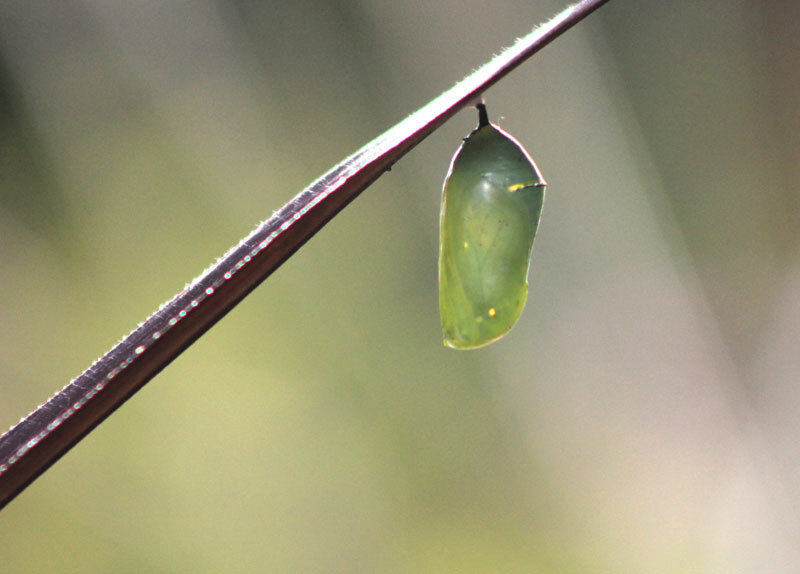 Like all butterflies and moths, monarchs have a life cycle with four stages of development: egg, larva—or caterpillar—pupa, and adult. These changes in form are also known as metamorphosis. Mating between adult butterflies occurs throughout the day, with more mating being observed in the mid- to late afternoon. Females lay their fertilized eggs on the undersides of milkweed leaves. 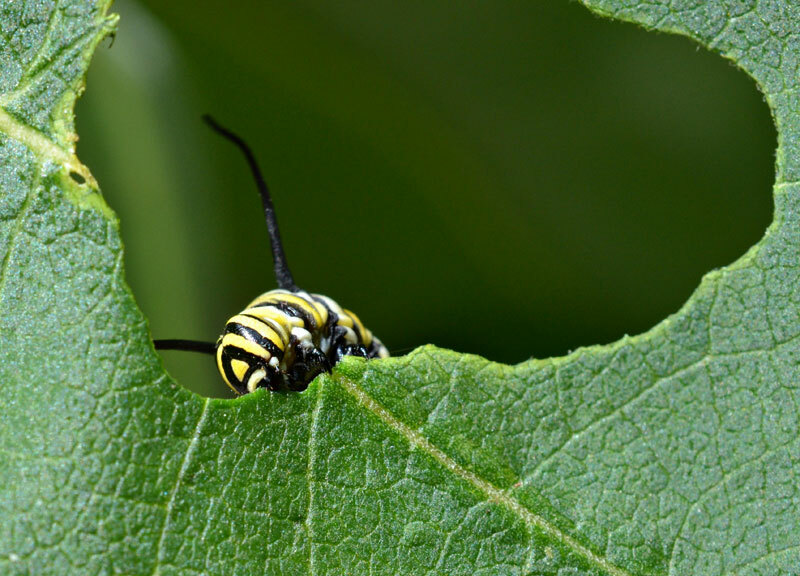 They identify the milkweed by scraping the leaf surface with their front legs and “smelling” the plant juices with their antennae, or feelers. A single female may lay as many as 400 eggs. The eggs are laid singly on the leaves, often on different leaves of the same plant and on nearby plants. As a result, dense collections of larvae can occur in large stands of milkweed. The eggs hatch in three to 12 days, depending on temperature. The larvae feed on the leaves for about two weeks, developing into plump caterpillars with vivid black, yellow, and white stripes. The caterpillar moults, or sheds its skin, up to four times as it grows to a length of about 5 cm. In preparation for the third stage, the caterpillar attaches itself to a suitable twig with its head facing downwards. It sheds its skin one last time and forms a hard protective casing. This transformation into a pupa, or chrysalis, takes a few hours. The completed pupa looks like a shiny jade-green vase with a band of golden speckles. Packed tightly inside, the caterpillar undergoes a miraculous transformation, emerging about two weeks later as the beautiful butterfly. A few hours before the adult emerges, the pupa becomes completely transparent, revealing the new butterfly inside. When the butterfly first emerges, its wings are small, thick, and leathery, and its body is full of fluid that it pumps into the wings. Much like inflating a balloon, this process causes the wings to expand. As the wings dry, they stiffen until the butterfly is ready for its first flight. In southern Canada, eastern monarchs produce two to three generations, or broods, each year from June to September. Development from egg to adult butterfly takes 20 to 45 days, depending on the day length, the temperature, and the availability and quality of the food plant. The average is about 30 days. Monarchs that emerge in late summer migrate. If they survive all winter their life span is six to nine months. They do not mature sexually before they migrate and do not breed during the winter period. Weather conditions are the principal factor in determining the size and breeding success of the monarch population. Cold, wet, and overcast conditions in the spring and summer breeding range can prevent adult butterflies from dispersing, mating, laying eggs, and feeding, since they require warm and sunny conditions to be active. Hot, dry summers with periods of drought are also harmful since these conditions reduce the quality and availability of larval food and nectar sources for the adults. Based on estimates of the number of butterflies overwintering in Mexico and California, the eastern monarch population currently numbers in the tens of millions, while the smaller western population numbers in the millions. Historical data indicates that the size of both populations fluctuates regularly, and often dramatically, as a result of winter storm mortality, poor breeding conditions, predation, parasites, disease, and other pressures in combination with each other. In the past, both populations have suffered losses approaching 90 percent but have recovered because the surviving 10 percent experienced excellent conditions in the breeding range. While a fluctuating population size appears to be the norm for monarchs, the eastern population is now suffering consistently higher levels of mortality. This may be reducing the population size to a level from which it cannot recover itself. The main reason for the decline in monarch populations has been the periodic natural disasters at the Mexican overwintering sites. Some sites may sustain losses of anywhere from 30 to 90 percent during winter storms. Human alteration of the habitat, particularly the opening of forests by logging, has reduced the protective effect of the forest canopy. This has increased the negative effects of winter storms and has made the overwintering monarchs more susceptible to predation from birds and mammals. In the past, these disasters have been counterbalanced by the increase in breeding habitat in eastern North America. However, widespread and increasing use of herbicides throughout North America may also result in dwindling fall migrations in the next few years, due to the eradication of host plants for larvae and nectar sources for adults in the breeding range. Without effective protection of the Mexican overwintering sites as well as protection of breeding habitats and nectar sources along migration routes in Canada and the United States, the eastern population of the monarch may become extirpated in North America early this century. “Extirpated” means that a species no longer exists in the wild in a particular location although it may occur elsewhere. Other causes of population decline for the eastern population include predation at the overwintering sites by the Black-headed Grosbeak and Black-backed Oriole, both of which can circumvent the monarch’s toxic properties and feed extensively on the roosting butterflies. The western population is threatened by real estate development along the California coast, active programs to eliminate introduced eucalyptus trees, and a recently discovered disease. 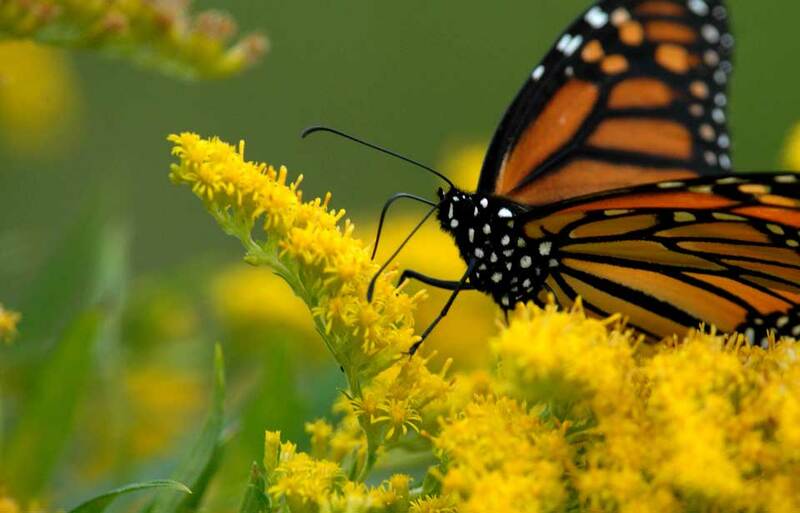 Various scientists have recognized the annual migration of the monarch in North America as an endangered phenomenon. In 1983 the spectacular winter roosts in both Mexico and California were designated as threatened phenomena by the World Conservation Union. This was the first such designation in the history of international conservation. 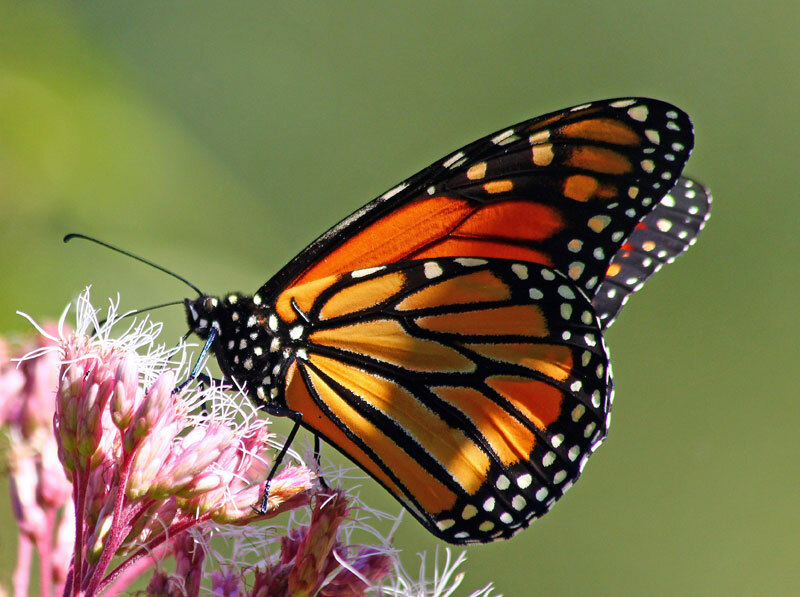 The new status was created to recognize the fact that the millions of monarchs migrating and overwintering in North America each year are imperilled, while acknowledging that the species as a whole is not in danger of extinction. “Extinct” means that a species no longer exists. 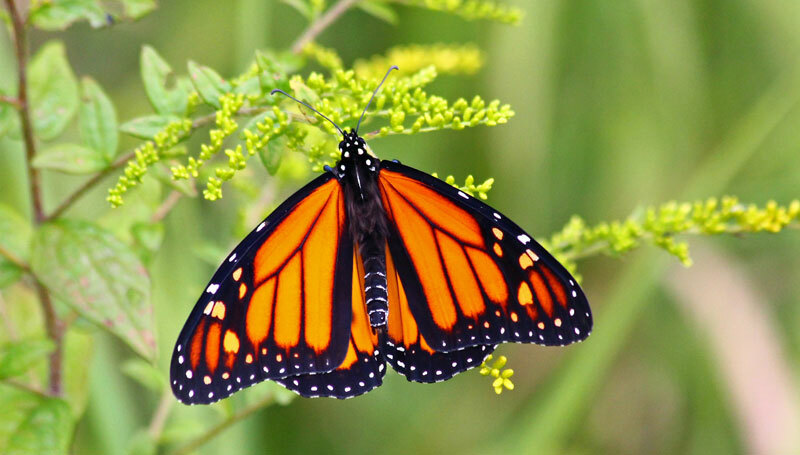 In October 1995, Point Pelee, Long Point, and Prince Edward Point in southern Ontario were designated as monarch reserves as part of an international agreement with Mexico. Little protection currently exists elsewhere in Canada with regard to the monarch and its habitats. 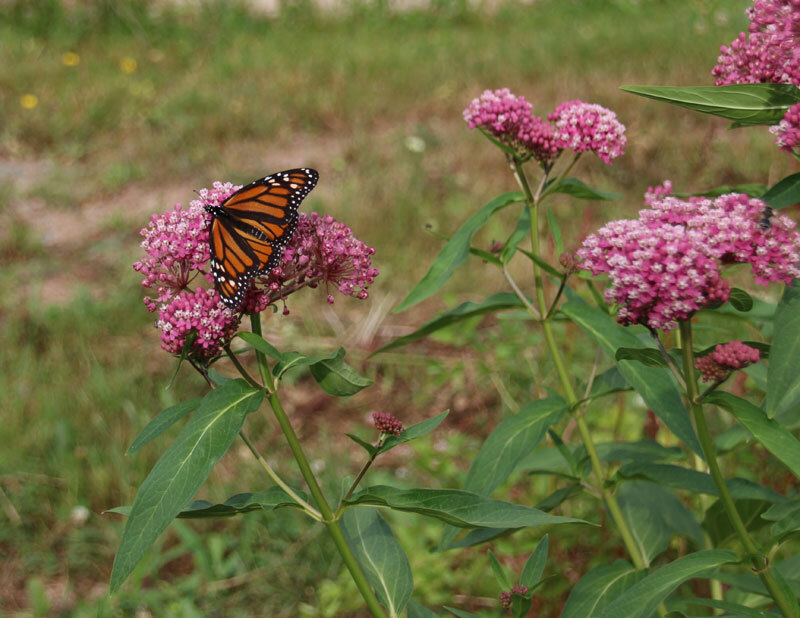 At present there is abundant habitat for monarchs in southern Ontario and Quebec, but this habitat can easily be lost if abandoned farms are put into active production, converted into housing estates, or become overgrown by trees and shrubs. Programs to eliminate milkweed can also eliminate habitat. Crolla, J.P., and Lafontaine, J.D. 1966. Status Report on the Monarch Butterfly (Danaus plexippus) in Canada. Submitted to Canadian Wildlife Service, Ottawa. © Her Majesty the Queen in Right of Canada, represented by the Minister of the Environment, 2003. All rights reserved.